Now let’s be clear, everything that follows is, for the time being, speculation, but when the seemingly random placement of dots are connected, they sure do make a pretty picture. LG and T-Mobile have not had a great relationship in the past, neither has LG and smartphones for that matter. It has taken a while for LG to offer up some phones on T-Mobile, and their offerings were weak at best. Don’t get me wrong, I’m not saying that they have been bad phones – in fact, I prefer LG to Samsung – but their T-mobile phones aren’t up to snuff. LG, though, is looking to change that. We will look back, again, to that (more correct than not) leaked roadmap, which clearly shows a couple of LG phones, one of which is an Android device. Couple that with our knowledge that LG will be making their presence known this year and you have yourself asking some questions. Well, LG has been talking the talk lately, some of which could be important. LG knows that they have been behind on the smartphone game, and they will change that. Their goal is to launch 10 more smartphones and sell 5 million units by years end, but it gets better. They have also come out saying that they are working on a device that uses a dual-core Nvidia Tegra processor. A single core Tegra processor can be found in the buttery smooth Zune HD, and should be amazing with Android. So, now we have a question. Is LG working on a dual-core Nvidia Tegra powered Android Optimus smartphone, to be released by years end? Only time will tell, but in the mean time, leave your thoughts in the comments! Make an attempt to not sound like trash when you post. Please. For all of us. How is that sounding like trash? Make an attempt to make sence genius. And before you recommend someone to make “sence” make sure you spell the word right… SENSE. How is that “sounding like trash”? Let’s see here. Insinuations of robbing a convenience store to get the money to purchase a phone. I mean one look at these forums and the replies, it’s quite obvious that the class level of T-Mobile customers isn’t exactly the highest, so perhaps this shouldn’t surprise me. T mobile has ALWAYS experimented openly with phones. I still think the Samsung Behold II was an experiment that can still go well, if T mobile takes responsibility for their customers. It is quite strange that they release feature phones, but ALL of the other networks have feature phones on their network, to be honestly are quite crappy. BUT for those folks that don’t want highly complex phones, they are fine. What I’d like to see is a partnership with Nokia from T mobile to carry the C line and N line of phones. These are great devices. T-Mobile take responsibility? Like T-Mobile develops the software for the device. You bought a Samsung device, in which Samsung used Google’s source code to develop the Behold II with their own drivers/software. T-Mobile has no responsibility for what OS the Manufacturers decide to put on the devices. Who wants to spend all that money updating a POS when you have the Galaxy S series. Samsung would rather make money, not lose it. u made me smile!… thank you! Well t-mobile has been talking about a phone with android and a dual core processor that is to be release in Q4 of this year, so lets hope that this is it. It isn’t. 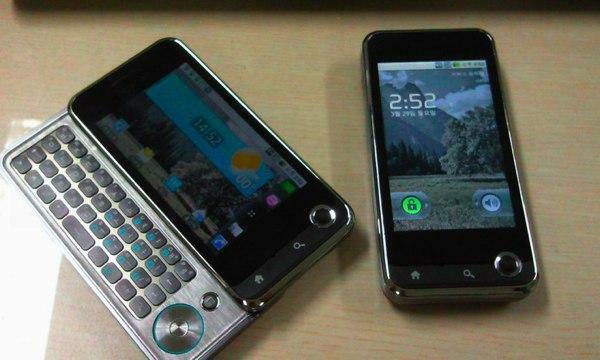 Google HTC Glacier. Looks nice. Question is what’s up with only home and search keys. I think back and menu are very important too. That seems to be one thing that needs to be standardized ala WP7. I’ve had 4 different Android phones in the past year and they all had their own DIFFERENT layout of the home, menu, back and search (genius) keys as well as trackball/joypad/trackpad setup. The Nexus setup with trackball seemed the best, but the trackball collected dirt from the inside of pockets or hip holsters and got dark over time. I think the nexus button layout (touch sensative and not clickable buttons like the MT3G) along with a trackpad like the one on the HTC desire would be optimal. Don’t see lg as a smart phone maker they never had any smart phone out before.what like to see what they have. I believe they need to calm down on the; who has the better phone wagon. With the new processor’s and dual cores to boot, where are the battery companies at? That phone is hideous. LG really needs to step their game up on product design. They’re terrible at designing products. With the exception of the Insignia 3-D LED HDTV. the phone pictured is an old phone, not the phone in the article. Actually, it’s not that old, it’s the Optimus Q, the second smartphone in our Optimus Series. It’s currently selling well in Korea. Our LG rep let it slip out that we were going to be getting an android from them this xmas. She than looked very embarrassed for letting it slip out and left the store. how about that mytouch3g 2.2 update? based on the speculation that Nvidia’s Tegra Processor is being used, it could mean LG is working to release an Android Tablet on T-Mobile. So maybe it isn’t a phone at all! Bah! I’ve been spoiled by HTC for more than 2 years now and will never choose an LG phone over them or nokia, motorola, samsung, Sony or apple. None of their dumbphones have ever impressed me (craptabulous kirfs); and the ally does nothing to convince me they’ll do any better with smartphones. UGH! well isnt that nice…my manager had an event with LG today at a certain hotel in NYC..i wonder if its about this. Ken Hong from LG here. In response to the question at the end of the post, yes, we will have a Tegra 2-powered smartphone out shortly. Country availability is still being discussed/negotiated.